Nail Biter! The Pens held on Saturday night to beat NHL goaltender Michael Leighton and the Phantoms 3-2 in a game that was close from start to finish. 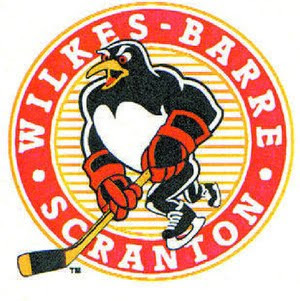 The lowly Phantoms were desperate for a victory and NHL goaltender Michael Leighton was on a "rehab assignment" but Jeffrey, Wallace, Tangradi and the rest of the Pens were able to overcome that with a nice effort Saturday night. After Adirondack took a lead off of a Eric Wellwood goal, Dustin Jeffrey responded with a laser shot that clang off the post behind Leighton and in to tie the game. It was Dustin's 13th goal of the season and his 29th point overall. (He would eventually pick up an assist to get 30 and tie Andrew Gordon for the points lead.) It was yet another big time goal from a player who has been the definition of big time this season. Tim Wallace has been pretty good too. He picked up the puck in the Phantoms' zone and ripped a shot past Leighton but not after deking Danny Syvret right out of his skates. Eric Tangradi would add an all-important insurance goal less than 2 minutes later to put the Pens up 3-1. Ben Holmstrom scored late to cut the lead down to 1, but the Pens counter-attacked well in the last minute and a half to keep the puck down in the offensive zone and away from Curry and the D.
The Phantoms were absolutely desperate to win. To put things into perspective, the Pens got their 20th win of the season tonight. The Phantoms have a total of 3. And they had Michael Leighton in goal on a conditioning assignment. It's not the first time this has happened to the Pens, who were matched against Semyon Varlamov a few weeks ago against the Bears. I guess having the X on your back is all part of being a top team. Nice to see the fans are starting to notice, and attendance has been on an uptick the last few weeks. Hopefully that support will carry over when the Pens take on the Marlies on Wednesday.